Providing you the best range of motorized sliding gate, automatic sliding gate, cantilever sliding gate, heavy duty cantilever sliding gate and heavy duty automatic sliding gate with effective & timely delivery. Motorized Sliding Gate is very convenient and efficient gates which operate electrically and can be opened and closed remotely, without having to physically move the gate by Hand. Conventional Sliding Gates are gates which use a ground mounted track for the gate wheels to move on. Tracked sliding gates can span larger opening widths. Optionally a pedestrian gate can build. 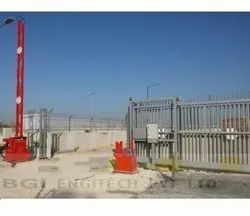 We are instrumental in catering to the variegated requirements of the customers by providing them with a commendable range of Automatic Sliding Gate. Engineered to meet the extreme demands of large openings, BGI's heavy-duty Cantilever Sliding Gate have been supplied with spans of up to 30 meters to close 60 m wide border crossings. The gate moves over steel roller bearings fitted on a carrying frame, which allows the wing to hover above the ground and move across sloping or uneven surfaces without the need for a track. Safety features include two pairs of photoelectric sensors to halt movement if a vehicle or person passes during operation, and a clutch for neutralizing or reversing the motor in the event of a collision with a person, vehicle or any other object. We are offering Heavy Duty Cantilever Sliding Gate to our client and we assure satisfaction and quality of the product. 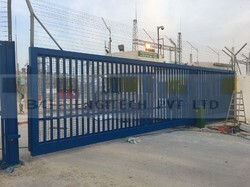 We are instrumental in catering to the variegated requirements of the customers by providing them with a commendable range of Heavy Duty Automatic Sliding Gate.